We started lessons this week after a long break so made it a light week. Each week will add in more until we are up to speed. Introducing quite a few things this year and much more reading involved. One thing I am totally stoked about, plus shooting myself in the foot for not doing so sooner, is getting the Voyages in English Teachers Guide. Oh my goodness, it is a gem. Last year we did without and I only taught from the grammar section based on Susan's Well Trained Mind recommendations. According to Bauer "the writing exercises are not useful in building expository writing skills and should be skipped," and recommended other writing programs. After reading through the teachers manual, I totally disagree and I could see was feeding the poor kid hamburger when all along I could have been feeding him steak. Yeah - Father looked at me strangely as well when I said that to him. Then he took a look at the guide and understood what I meant. I've used a couple of the other writing programs and they didn't work so well for us. My opinion, the writing section is awesome, plus builds upon the grammar section. The guide says it is a balanced plan of writing and grammar and it sure as heck is. Plus it has built in some great social study and science connections to have James research and write about. So I'll be spending the weekend outlining the first few chapters and figuring out the schedule based on their sample "one chapter, one month." 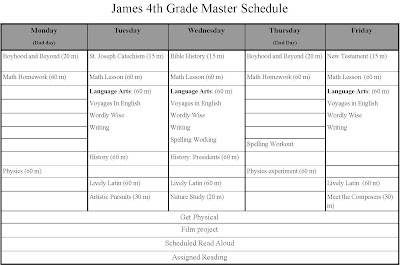 I also semi figured out the schedule for a few things, plotted it out and typed up a master schedule. It is subject to change. Faith, Character and Catechism: James and Father read the first two chapters in Boyhood and Beyond by Bob Shultz and discussed. We started St. Joseph's Catechism and did lesson 1 - Purpose of man's existence, Read Bible History- Chapter 1 Creation of the World and started reading Matthew in the New Testament. All lead to some interesting discussions. Saxon Math: Going back to basics and getting more, less, left and right down pat, plus how to graph. I have a feeling we are going to move quickly through some of the lessons to the more difficult stuff. Writing wise, he had to write a short paper for cub scouts on someone he considered a good citizen and he picked George Lucas. It was short and sweet. "What makes George Lucas a good citizen?" In 1991, George Lucas started the George Lucas educational foundation. George Lucas testified before congress to improve internet for all school children. George Lucas believes that the internet is the new learning method and is replacing the text book. I am a member of the foundation which also publishes a great magazine "Edutopia". Lucas is trying to reform the education system and there are many interesting insights in the magazine and the web site is chock full of information. Someday James will be going to public school, so hope to see some of the innovations Lucas and company discusses put into effect. He also wrote a letter to George Lucas requesting a tour of his studios and skywalker ranch, since he is a budding filmmaker and loves all his movies. His personal secretary wrote James a nice letter back (since Mr. Lucas is a very busy man) and suggested a couple biographies to read and sent him a star wars magazine. Physics: James and Father started reading the first chapter - motion in Exploring the World of Physics and talking about physics. I also had them familiarize themselves with the Physics workshop kit they will be doing experiments from each week. Lots of neat experiments in this one and the pieces are all similar to legos. James has already tried to abscond with a few pieces for his collection. Speaking of lego's, he completed the x wing fighter. He got really into it and after I went to bed one night, father discovered him still working on it at 2:00 a.m. We had to lay down a few rules. Assigned Reading: I'm trying to assign books I pick out and have James read for 30 minutes to himself. I had him read "My Life as an afterthought astronaut" and he decided he didn't like it, so read the first two chapters and the last chapter. When he came to tell me he had finished the book after 15 minutes or so and couldn't answer any question about the characters, I knew something was up. It finally came out he skipped to the end because he didn't like it. He and father read together "East of the Sun and West of the Moon" from The Blue Fairy book. Both told me it was very hard to read with the english verbage and father said James kept correcting his english. Don't know if reading the tales are going to work out for those two. May have to rethink it. 12. Meg Mackintosh and the Mystery at Camp Creepy. The list doesn't include the read alouds I've chosen for the year that include Wind and the Willows, Swallows and Amazons and a few others. This year is going to involve much more reading and writing. We'll adjust as we go along. 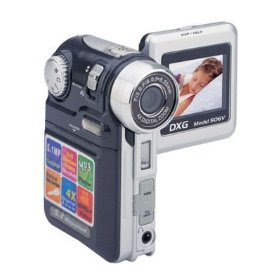 We also bought him one of these to aid him in his filmmaking project. I am always amazed at what a great education you are giving your son!! I wish public education had enough time to make school fun like this!! 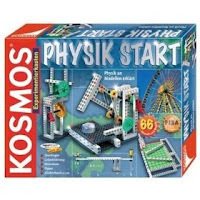 The Physik Start kit looks great. I've been drooling over that one for a while!